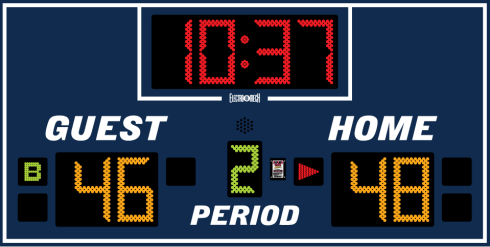 Model LX2340 is a fairly recent addition to Electro-Mech's growing line of indoor LED basketball scoreboards. It keeps the family tradition of using three different LED colors to provide visual distinction between different display areas on the scoreboard. Red is for the Game Clock. Amber is for the Scores. Green is for the Period. The extra touch of Double Bonus indicators is a standard feature on this model. Possible upgrades include Electronic Team names, built-in ID panels, and wireless communication using our hugely successful and reliable ScoreLink system.